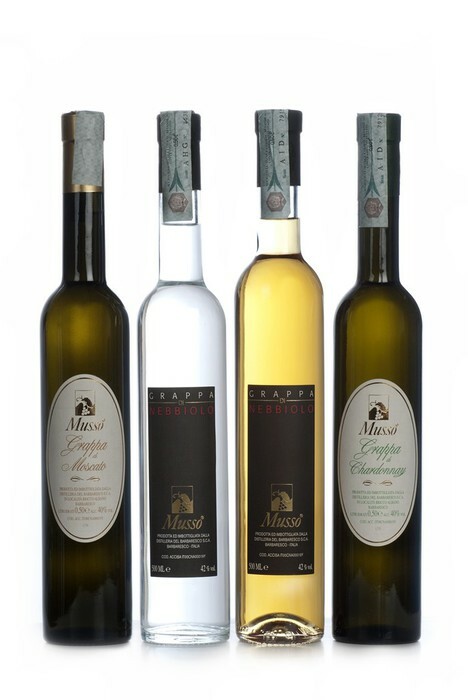 Grappa made from Moscato d’Asti grapes grown in Alba and Asti area. After fermentation and pressing of the grapes, the pomace is brought to the distillery, where the skins are fermented and distilled to get the most of the perfumes and aromas. Tasting Notes: clear white in color, intense, immersive, typical of moscato grapes freshly picked. Soft flavor rich in fruity flavors and delicately sweet with a persistent finish. Grappa made from Chardonnay grapes grown on our estate. After fermentation and pressing of the grapes, the pomace is brought to the distillery, where the skins are fermented and distilled to get the most of the perfumes and aromas . Tasting Notes: Clear white in color with delicate floral scents. Persistent and elegant taste with fruit aromas. Grappa obtained from the pomace of Nebbiolo grapes grown in our estate vineyards in Barbaresco. The fresh pomace arrives at the distillery already fermented and the same day starts distillation. It is then kept in stainless steel tanks for a few months, to refine to make the most of the perfumes and aromas. Tasting Notes: clear white in color, full bouquet with floral and fruity notes. Grappa obtained from the pomace of Nebbiolo grapes grown in our vineyards in Barbaresco. The grappa is matured for several months in small wooden barrels and then aged in the bottle. Tasting Notes: light amber in color, ethereal, highlighting the personality of the nebbiolo grape; full-bodied, dry, soft with beautiful structure.